By 2017, the share of the German plants that build Audi models is projected to fall to 45 percent as annual output doubles to 1.9 million vehicles, much of it at new plants in China, Mexico and an expanded facility in Hungary. BERLIN (Bloomberg) -- Even as rivals Mercedes-Benz and BMW spent more than a decade expanding production overseas, Audi has clung steadfastly to its flagship factories in Germany. The Volkswagen AG unit is planning to add new plants at an unprecedented pace to chase luxury auto leader BMW. Until three years ago Audi produced 75 percent of its vehicles in the German cities of Ingolstadt and Neckarsulm, focusing largely on increasing quality and expanding its model lineup. By 2017, the share of the German plants is projected to fall to 45 percent as annual production doubles to 1.9 million vehicles, much of it at new plants in China and Mexico and an expanded facility in Hungary. 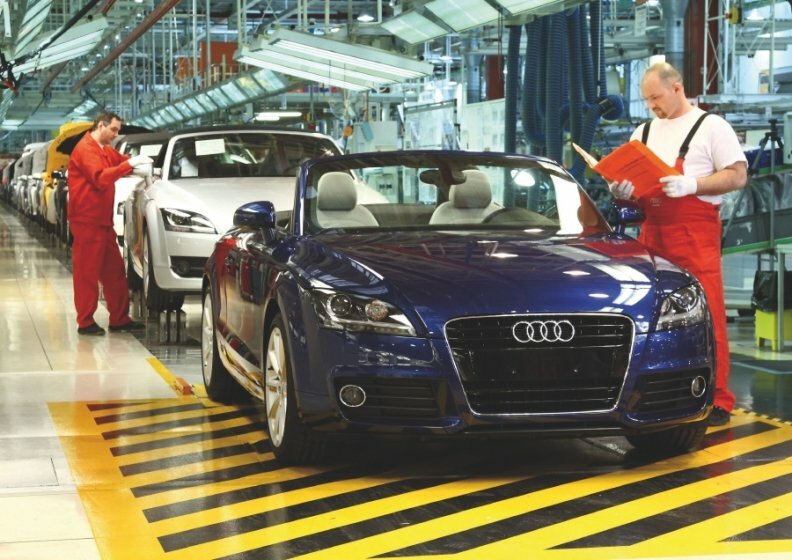 "We've reached the limits of our capacity," Frank Dreves, Audi's production chief, said during a four-hour tour of the Ingolstadt factory, where he likes to pop in unannounced to chat with line workers. "We need to expand." The plan will test Audi's ability to integrate new personnel and suppliers while maintaining standards. After largely closing the gap with BMW in terms of quality and reputation, a slipup could endanger its target of boosting sales 54 percent to 2 million vehicles by 2020. "Audi doesn't have any more low-hanging fruit," said Christoph Stuermer, an analyst with IHS Automotive in Frankfurt. "The complexity of the production system is increasing quite a lot. They need to keep that under control. Their growth path is at stake." Audi plays a key role in Volkswagen's goal of overtaking General Motors Co. as the world's largest automaker because its margins generate cash to fuel investment. The unit accounted for 44 percent of VW's first-quarter operating profit even though it delivered just 15 percent of the group's vehicles. The brand received special attention in a management reorganization unveiled last week. Wolfgang Duerheimer, head of the ultra-luxury Bentley nameplate and a former Porsche engineer, will transfer to Audi to oversee development. Luca de Meo, until now VW's marketing chief, was appointed to lead sales. IHS's Stuermer described the two executives as "stars." Audi has grown over the past few years by adding new models such as the A1 subcompact, the A7 four-door luxury coupe and the Q5 sport-utility vehicle to compete with BMW and Mercedes. That growth was supported by using spare capacity at a former VW facility in Belgium and a factory owned by Spanish unit SEAT. While Audi's lineup is now competitive with its rivals, BMW and Mercedes long ago added factories in South Africa, the U.S. and China, giving them a far bigger global footprint. A 900 million-euro expansion of Audi's plant in Gyor, Hungary, will boost capacity to 125,000 cars from 2013, triple last year's output. Next year will also mark the start of production of a variant of the A3 compact at a new factory in Foshan, China, part of VW's joint venture with China FAW Group Corp. The plant, Audi's second in China, will boost Audi's annual capacity there by 40 percent to 700,000 vehicles. Audi's most ambitious project is an all-new facility in Mexico to produce about 150,000 Q5 SUVs a year. The project, due to start production in 2016, underscores Audi's bid to catch up in the U.S., where sales are about half the level of BMW and Mercedes. "The risk potential of a green-field factory is bigger because it's all in your hands," said Stefan Bratzel, director of the Center of Automotive Management at the University of Applied Sciences in Bergisch Gladbach, Germany. "Audi's shifting from the hunter phase and has to consolidate what they have without losing sight of growth." Audi reckons it can handle the task. In a virtual reality "cave" in Ingolstadt, engineers simulate the entire assembly of a new model months before production starts in order to fine tune the process. For the next-generation A3, which starts deliveries this summer, Audi identified a welding point that could have collided with a bracket used for mounting the front end. The discovery resulted in a redesign before production started, saving costs and improving quality. Such tools will help Audi as it expands, said Dreves. "The biggest challenge is to handle the growing complexity that our customers demand while increasing volumes and maintaining quality," said Dreves. He doesn't ignore details in his bid to improve Audi's operations. To reduce time spent cleaning up scuff marks from transport carts, Dreves ordered white wheels. And to avoid smears from fingers and shoes, doors were covered with metal sheets. "We train our workers to think of every car they assemble as their own," said Dreves. "There's nothing more important than quality. Short term success is nice, but I'd rather be part of a long-term success."